Geoff Corry is one of the very few tour operators accredited to guide both fishing and hunting safaris. Geoff has guided such fishing notables as Rex Hunt and Paul Burt. He has featured on Rex Hunt Fishing, Gone Fishing and in the U.S.A. on Wild Outdoor Adventures. Geoff guided at, and managed, the fishing lodge Barra Base and Jessie Camp on the Tiwi Islands for 10 years. Day and extended fishing tours. A personalised itinerary, which can include a number of destinations. All meals, light refreshments and fishing accommodation included. 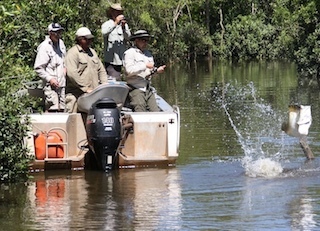 Bluewater, river and billabong fishing. Mothership trips to remote locations. Expert Tuition in lure and flyfishing. Knowledge on our amazing wildlife. Chasing our lovely Mud Crabs, a delicacy of the North. All transfers to and from Darwin in an airconditioned 4WD. Quality tackle, on a replace if lost or broken basis. For greater comfort, personalised tuition and the best fishing opportunity during your day, we take a maximum of 3 clients per guide and boat. All ours guides are experienced and accredited.